I've had a mad traditional moment, and have made a new quilt for my bed. But, when I say mad, I mean really stupid mad. I decided to make it double sided, didn't I. So, we have a queen size, double sided project, which sounded like a really good idea when I was designing it, but by heck, trying to stitch it all together, and keeping the perfectionist at bay was quite a trick. Eventually the perfectionist portion of me just gave up and said "I don't give a damn, just get this stupid quilt finished", which is what the sensible side of me did. Anyway, whilst it is mighty fine, and my bed doesn't mind all the stitching flaws, (puckers, misaligned points, wobbly borders etc etc) it is finished, and I am pleased with the overall design,and it was all made from stash fabric. But, viewers, be warned, doubled sided quilts are HEAVY. Not good for sleeping under, at least the bed looks nice in amongst the jumble and weary bedroom. I really should paint the walls and replace the holey carpet..oh well, when I stop sewing long enough I'm sure I will! Just to prove it really is double sided! 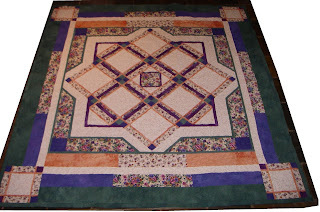 Quilting patterns were based on the pansy fabrics used. You have made an amazing quilts and these all are made from stash fabric. Double sided quilts are so heavy but make beds so nice. WOW - that is so much a perfectionist project ! congratulations on finishing it and not having a nervous breakdown on the way. What a wonderful quilt and what an achievement. I love seeing other people's quilts but haven't the skill or patience to tackle one myself, though I have done very simple patchwork. There is too much maths involved for me! Congratulations on a beautiful piece of work. A friend needed some pansies recently and I got out my pansy crate. I was a little disconcerted to discover 37 color ways of the large marcus bros Faye Burgos Pansy prints. The large ones. I fear I am a collector and pretend P & W person. But that quilt re inspires me. 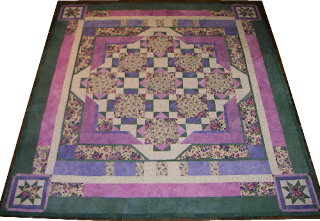 A beautiful quilt Bernadine. Perhaps you could bring it for chantelle at 2Q sometime? I'd love to see it!